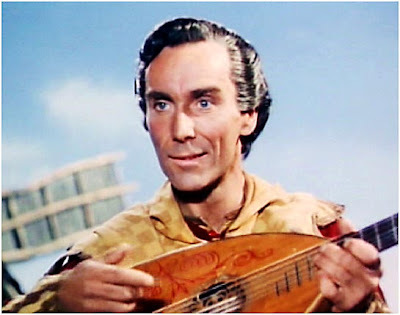 Above: From the opening shots of the film The Black Knight starring Alan Ladd and made in England to the famous Walt Disney British made The Story of Robin Hood and His Merrie Men 1952 starring Richard Todd and Joan Rice, we see clips of Elton Hayes appearing – and mainly singing his way through each respective role. He was very good. “At the age of 86 Elton Hayes died peacefully in his sleep at the West Suffolk Hospital after a long illness borne with great courage. As soon as you met Elton you realised that he was a man who would always keep a promise. There was an old-world courtesy about him. A smart dapper man with a penchant for bow ties: “The real thing not these clip-on or elastic things.” With a twinkle in his eyes and his charming easy going manner he won many friends wherever he went. A lifelong fan of Elton, I was indeed fortunate to make contact with him again about six years ago. We corresponded for a while; then, following the stroke, which made writing difficult for him, we continued our friendship by telephone. The seriousness of his last illness was known only to his closest friends, so the news of his death was quite a shock. Elton left me his own ‘Short Biography’ and his friends, Bill and Sallie Walrond, who cared for him until his death, have entrustred me with his personal collection of photographs, press cuttings and other memorabilia, including 3 bow ties! Born of theatrical parents on 16th February 1915 at Bletchley, Buckinghamshire, Elton faced the footlights at a very early age. The curly-haired, blue-eyed little boy first sang on stage when he was four. Aged not quite 10 years (illegally, being under age and having no permit), he appeared in the prologue of a pantomime at Canterbury, Kent in 1925/26, whilst also employed as a call-boy and stage manager, at the all-in salary of 5/- a week. He was also studying music under Professor Fritz Keinly of Austria with a view to becoming a serious musician and concert violinist. In his early teens he won a scholarship to Fay Compton’s Academy of Dtamatic Art where he received an extensive theatrical education, from Shakespeare to Operetta, tap dancing to ballet and theatrical production. Not being prepared to sit around waiting for ‘the big break’ into theatre, Elton returned to the family tradition of variety, plus juvenile character parts in rep and chorus dancing in musical comedy. He demonstrated his amazing versatility with a speciality act, singing, playing the violin and tap dancing all at the same time. As ”Eltonio’ he entertained at one night venues such as social clubs etc. He then joined three brothers in a musical variety act, ‘The Four Brownie Boys’. Elton said that he was very fit in those days. He needed to because in Cine Variety he sometimes gave five performances a day, plus late night cabaret, finally getting home after dawn. He toured Cornwall in 1937 with ‘Musical Cheers Co’ where he met his wife Betty Inman (ex Stuttgart Ballet). At the outbreak of war all theatres immediately closed, so driving a delivery van around the home counties became the means of paying the rent until ENSA invited him to put together one of their first mobile units. Above: At Denham chatting to Walt Disney and Richard Todd – he really was in the big league here ! He enlisted into the Army in October 1943. His decision to take his guitar with him was to influence the whole of his future career; within 6 weeks of army life he was entertaining his companions at army concerts. He was first a gunner in The Royal Artillery and later gained a commission in the Royal West Kent Regiment. The Commanding Officer of ENSA India and SEAC, Col Jack Hawkins, requested that Major Hayes should join his Command and Elton became O.C. ENSA N.W. Frontier Provinces, India. Eventually he took over Jack’s job and had the task of closing down all the troops’ entertainment centres in Central Provinces India before demobilisation. Yet another series was ‘A Tinker’s Tales’ in which Elton, as an itinerant tinker, narrated a story which he and other actors dramatised as a musical play. Interspersed with radio came TV, both light entertainment and drama. Television proved the Elton’s personality was as important to his act as was his small guitar. He took over the 15-minute period originally scheduled for ‘The Harding Interviews’ during Gilbert Harding’s absence. 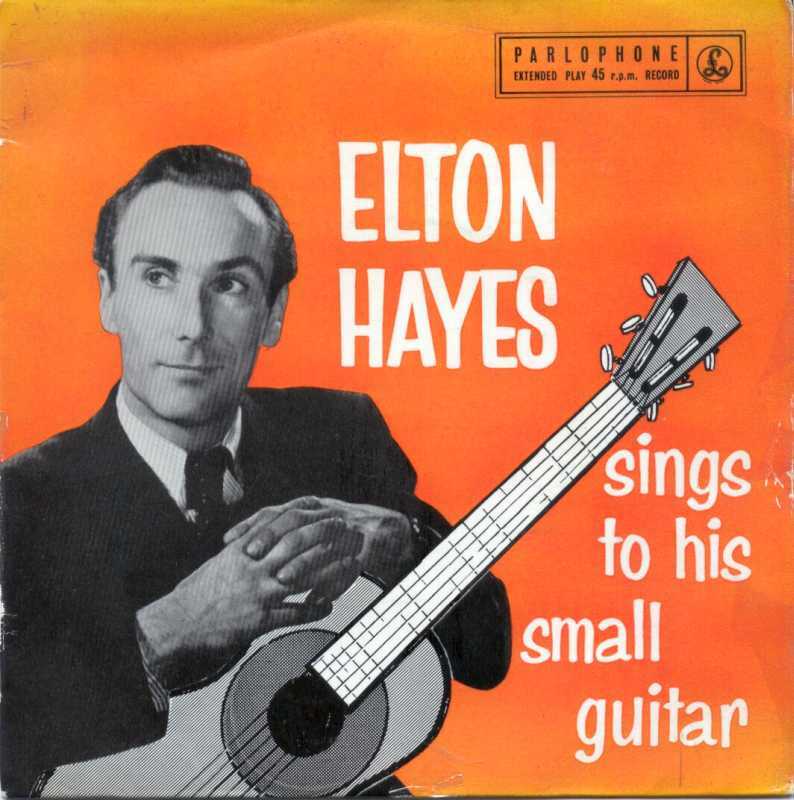 He also introduced and sang in the ‘Centre Show’, was a frequent guest on the Leonard Sachs’ ‘Good Old Days’ olde time music hall, appeared in the series ‘The Minstrel Show’ and travelled with the BBC Children’s Caravan for three summer seasons, composing and performing special original material. Surprisingly to some viewers, he was cast in a straight acting role in Chekhov’s ‘Three Sisters’ for which he also wrote the music. When Walt Disney’s ‘Treasure Island’ was made Elton had the task of arranging the old sea shanties sung on board the Hispaniola. This was followed by the job of researching ancient ballads for their forthcoming production of ‘Robin Hood.’ The producer, Perce Pearce asked him to assist in another actor’s screen test, then sprang the surprise that it had been Elton on test and the part of Alan-a-Dale was his! So good was he in that role that, although it started as a few lines, it developed into one of the main parts in the film. The success of the film led to a nineteen-city tour of the USA and Canada, making 113 radio and TV appearances in 8 hectic weeks. Sadly his second film The Black Knight did not enjoy the same success. One of the film ‘extras’ inadvertently wore Elton’s costume and was conspicuously killed in an early scene. Continuity failed to notice. Consequently all Elton’s scenes were later consigned to the cutting room floor. He sang in the Light Music Festival at the Royal Festival Hall, the Royal Film Performance at the Empire, Leicester Square, innumerable other concert appearances, private functions and then trips to the continent for recitals of higher academic standard to music societies, universities, international musicians etc. The nervous tensions of the concert platform began to take their toll and Elton realised that it was time for a change of career. Being a confirmed country lover the choice was easy; he became a farmer. He bought a 47-acre farm at Hartest, near Bury St. Edmunds, Suffolk and soon built up a prestgious herd of pedigree pigs. He now found time to return to his youthful hobby of horses. This brought him into contact with the members of the British Driving Society and the art of Carriage driving. Like everything else, Elton threw himself into this new interest with enthusiasm and was soon skilled enough to win awards for driving tandem (two horses, one behind the other). This led to him learning to play and compose music for the Post and Coach Horns. Sadly a severe stroke in 1995 put an end to these activities and Elton had to give up his farm and move to live with friends at nearby Cockfield. With characteristic courage and determination he overcame many of the difficulties associated with the stroke but lost the brave battle he had with his final illness. hi, I bought a guitar at auction belonging to EH a few years ago, and with it came some personal items, incl an old passport, the royal variety medal, some handwritten musoc scores, and a few letters. I would like this not to be thrown away, but go to someone who might like to have it. Might ths be you? no charge, I will put all in an envelope and post off at my cost. the guitar was fantastic, bought new by him in Ney York, and it is now professionally played, in Italy. Thanks Brian Cohen.